Fix bayonets! : I am still alive! 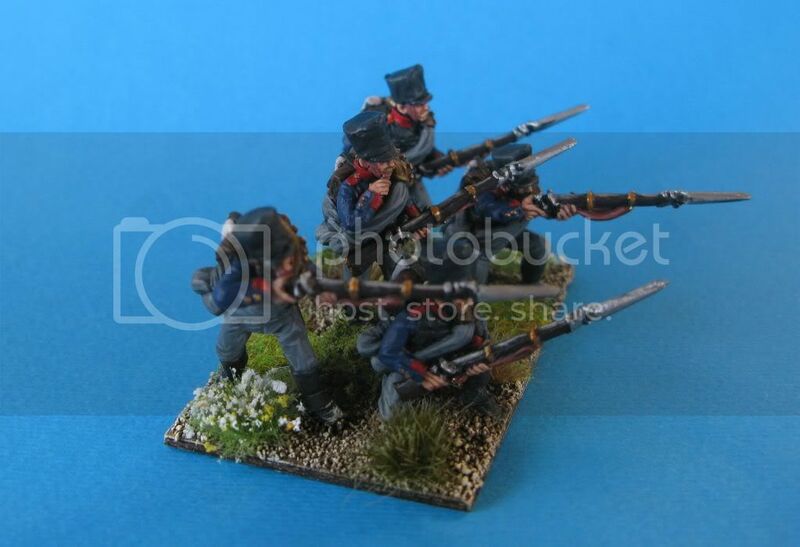 and this time I am painting Prussians! It has been a long time since I posted anything so let me say that I am glad to be back again! 2014 was a busy year for me both work wise and life wise. I finally decided to take a big step and move in with my girlfriend so my hobby time and space have been greatly reduced! That doesn't mean that I didn't paint though! Over the course of the past year I concentrated mainly on my Prussians and painted four battalions of musketeers and 1 battalion of fusiliers plus a 4 gun battery. All of them by the Perry twins. This however will change! 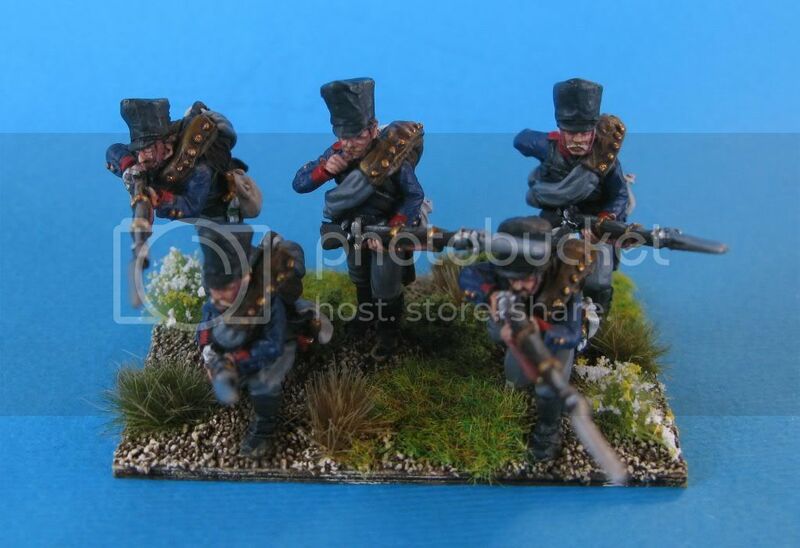 Beginning from today I will slowly start updating this space with photos of my Prussians! Figures (as always) are Perry and are based 5 per base. Each base however has the dimensions for 8 figures. I did this purely for aesthetic reasons. 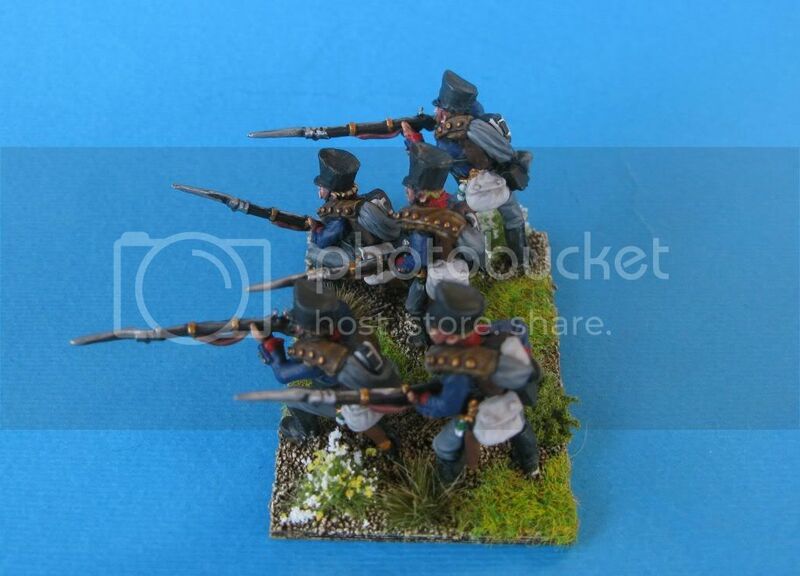 8 skirmishing figures would look too crowded so I deliberately chose 5. Hopefully tonight I will get enough time to photograph the rest of the battalion! On a side note let me show you my current WIP and my latest acquisition! Those black figures over there are 32 Silesian Fusiliers waiting to be painted.... 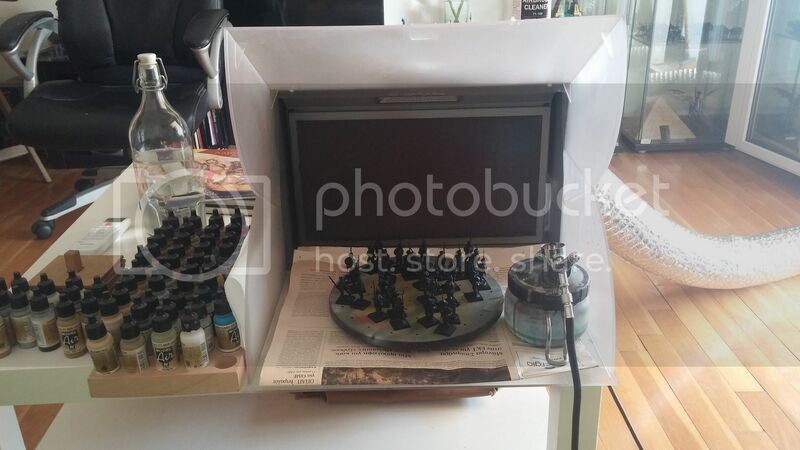 The thing they are sitting in is a spray booth and that little jar next to them is where my faithful airbrush is resting! Basically a year ago (so not so recently) I bought an Iwata airbrush mainly for painting my fantasy figures but quickly I started realising that I could easily use it to mass basecoat my Napoleonics. In this case I simply undercoated all 32 of them in a very dark grey that will basically form the basis for the black and grey colours on this battalion. If I had to do this by brush I would have easily spent more than 1 hour. With the airbrush it only took me 7-10 minutes. Imagine how much faster I will be able to paint greatcoated infantry! So hopefully tonight I will be able to post the rest of my battalion! Good man achilles, nice to see you back! Have you thought about capturing your units on video and uploading to YouTube?